Today's Coast to Coast gets down to business with a stunning Op-Ed in Pennsylvania and ends up in California at Disney On Ice's "Dare to Dream". Check it out! 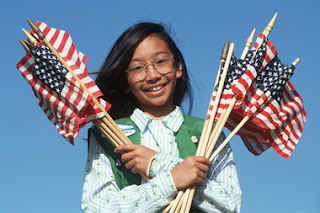 In Pennsylvania, The Patriot-News published an Op-Ed by Josette Plank about the overwhelmingly positive benefits of Girl Scouts. "My middle child is a Cadette Girl Scout in sixth grade," writes Plank. "With the money her troop earned selling cookies – taking orders door-to-door on cold winter afternoons and “manning” day-long cookie booths – the scouts have visited the National Constitution Center in Philadelphia, spent the day with hundreds of sister troops at the Newseum in Washington, D.C. learning about the history and freedom of the press, got up close and personal with great works of art at the Metropolitan Museum of Art in New York City, and learned how rocks rock at Lincoln Caverns." Be sure to read the entire piece. The Gleaner, KY, reports that two Girl Scouts received high praise Tuesday from Henderson Fiscal Court as they presented their plan for increased safety at the fairgrounds by installing traffic control signs. "They've done an outstanding job and put a lot of work into it," said Judge-executive Hugh McCormick, noting the girls refused the county's offer to pay for the signs. They insisted on presenting the county with a check for $200 that they raised. In Massachusetts, the Northborough Patch reports that Girl Scouts from Troop 30484 are working on their Silver Award Project, which involves helping to give underprivileged children a good start to the new year. Collection boxes placed at the four elementary schools in Northborough will a place to collect new school supplies, as well as gently used books, to support the needy children in Worcester. Iowa's KWQC News reports that business and civic leaders from Iowa are expected to join forces at an annual fundraiser for Girl Scouts and Boy Scouts organizations in the state. The event aims to raise money for the Girl Scouts of Greater Iowa and the Mid-Iowa Council Boy Scouts of America. Nearly 40,000 children in the state are involved in the organizations. California's Press-Telegram reports that more than 60 girls from at-risk Long Beach neighborhoods wwere invited to "Dare to Dream" recently - just like one of Disney's most popular princesses did. Whether it's becoming a doctor, lawyer, nurse or astronaut, the girls were encouraged to follow their hearts and realize their dream is special and achievable. After the event, the Girls Scouts and their families were provided tickets to attend the opening night performance of Disney On Ice's "Dare to Dream".